Durham cricketer Mark Wood announced his return to Test cricket in remarkable fashion after his career-best five-wicket haul inspired England to a 232 run victory over the Windies in St Lucia. On Day Two, Wood ended with figures of 5/41, the first time he has taken five in a Test innings, to send England into an 142-run lead at the Darren Sammy Cricket Ground. The 29-year-old was introduced in the 22nd over and featured in his first bowl in Test cricket since Pakistan in May as it took Wood just five balls to strike as Shai Hope’s uneven drive to Rory Burns at gully. Wood then ended his first over on a hat-trick as Roston Chase edged another delivery to Burns before Wood boosted England’s chances of avoiding a whitewash in the three-match series by claiming two more in an eight-over burst before tea. A maiden Test five-fer, is it? The star of the first Test in Barbados, Shimron Hetmyer, edged to Captain Joe Root at first slip before Darren Bravo followed in similar circumstances one over later. And Wood capped off a memorable time in the Caribbean to clean up Shannon Gabriel for 4 with another quick delivery and seal his career-best five-wicket haul to bowl out the hosts for 154 & 252 to galvanize England to a consolation victory. 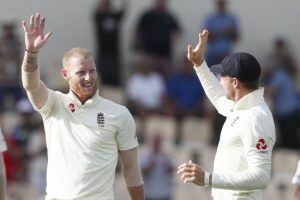 In truth, it has been a mixed winter for England, starting with an impressive 3-0 series victory in Sri Lanka and ending with bitter disappointment with several batting collapses and a 2-1 defeat in the Caribbean.